My memories of celebrating national days like the Republic Day and the Independence Day all through my life is limited to hoisting the national flag, shouting nationalistic slogans, having a few cultural events and eating the sweets that are distributed on the occasion. To be honest, a certain degree of monotony and ritualism had set in and I had to keep inspiring myself and others around me to go through with the formalities. We would always invite some local leader or elderly celebrity to hoist the national flag and share his wisdom with us. While all this is and shall remain a symbol of reminding ourselves of our colonial past and our non-violent struggle to get independence and give ourselves one of the world’s best constitutions, its meaning and significance remained superficial. This January 26th was very different. It all began with Brigadier Dr Rajan suggesting that we ask the GRAAM team members to conceive and organize the celebrations. Though the time was short, the team came up with a very different and meaningful way of doing this. Apart from involving many colleagues from other departments, they also made sure that this would be a day to remember. A week ago, was the quiz for students of local colleges on the Indian constitution. They also planned an online quiz on the same topic for the staff. This was to be preceded by a formal training on the Indian Constitution and its relevance to human development and social progress. Though this did not take off, they are planning on having it soon. The day itself was very different. The Guests of honour were three outstanding people who represented ‘We the People’. They were members of local communities from nearby villages. They were special people who have been quietly working in the Indian villages, trying to make a difference. Muthamma is a Junior Health Assistant working in one of the sub-centers located in Deburu village and is attached to the Kalale PHC in Nanjangud Taluk. She has been striving to provide all the services that one can provide at the sub-center level to the people that she serves. Despite the limitations that a Government public delivery system imposes, she has been going about her job creditably and with a sense of commitment that is rarely seen nowadays. Manjula is another outstanding ASHA worker from Kereyuru village. When most other ASHAs are being demotivated by a variety of social and financial reasons, she has been going about rendering her services without any thought for payments due to her. The time of the day or night is no consideration for her and all she thinks about are the mothers and children in her jurisdiction. Mahalingu was the third guest and he is a farmer and social worker from Hosuru village of KR Nagar Taluk. Apart from having voluntarily involved himself in various government education and health programs, he has been an active member of the local Village Health and Sanitation Committee (VHSC). 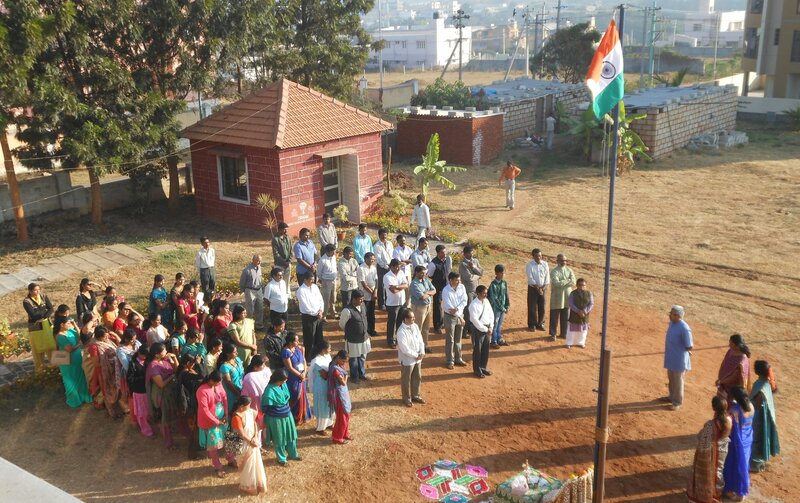 Muthamma and Manjula hoisted the national flag and shared their experiences and the joy of being recognized. We felicitated all of them for their selfless and dedicated services to the community. This genuine and much deserving recognition of ‘the common people’ is indeed the best way that we could remember our Constitution and it truly made us feel proud to be part of the Indian Republic. The day did not end here. We went on to celebrate the birthdays of all employees, volunteers and the children of our Vidyakiran program who were born in January. Mary sang a lovely song invoking blessings of the Lord in recognition of the birthday of Preeti Shah, one of Indicorps volunteers. The events that followed were consciously built around the theme of ‘Celebrating Diversity’. India’s diversity is unique and has to be celebrated. This was done today in the cooking, painting, quiz and other competitions that the staff participated in. To me it was truly a day to remember and to remind ourselves of the extraordinary document called our ‘Constitution’ that we gave unto ourselves. All we need are enlightened citizenry to internalize and translate the ideas of social engineering that are embedded in the Constitution to make our nation truly great.